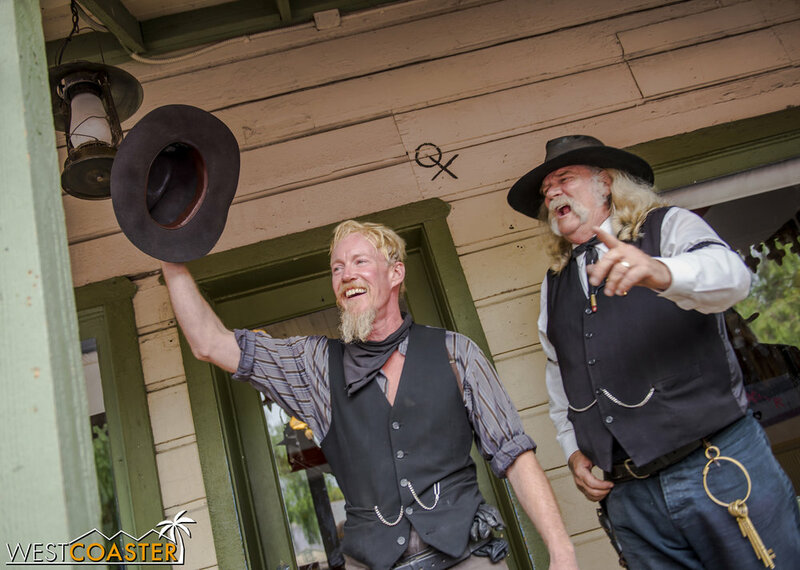 A week belated comes our wrap-up of this year's Ghost Town Alive! 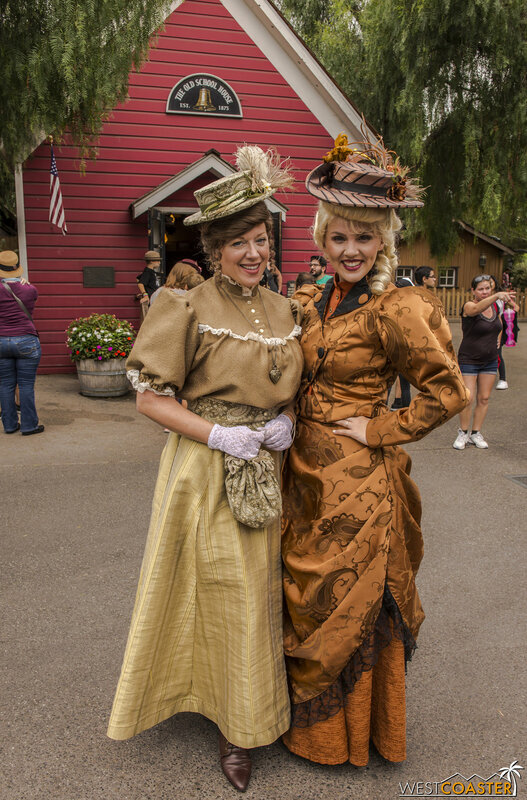 event from Knott's Berry Farm. 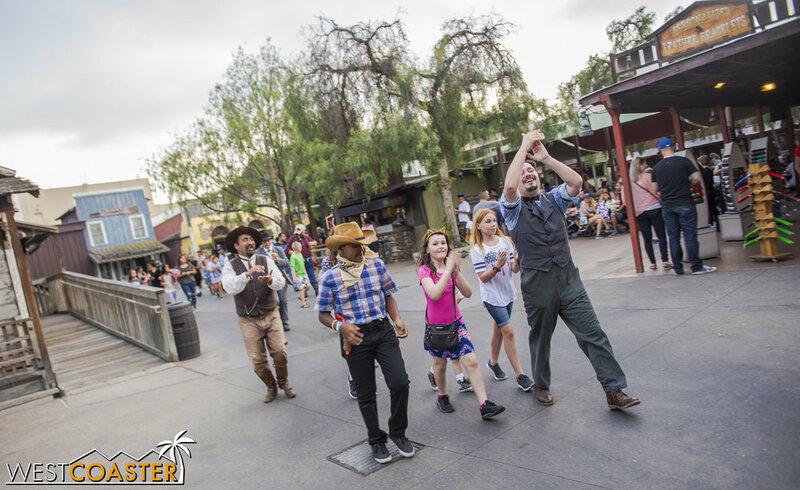 We stopped by earlier this summer to check out the sophomore offering of Knott's summer seasonal attraction, which followed up last year's successful event and played off its explosive finale. What would this year's final day bring, and would there be a cliffhanger like last year to provide a foundation for next year? Read on and find out in this massive photo spread! Before we get into the actual Ghost Town Alive! proceedings, we need to cover a few business matters. All summer, Knott's guests have noticed that the beloved Catawampus had vanished from his usual spot next to the Livery Stable in Ghost Town. In the middle of the summer, an unbelievable development occurred when a tiny Catawampus appeared. Wasn't the species extinct? And yet, there it was. Well, on Labor Day, Catawampus reappeared at its old perch, with Kittiewampus in tow. Now the two of them spend their days peacefully back in Ghost Town, and though it will take some time getting used to a second Catawampus, it's good to have Cattie back! Catawampus is back and looking like he/she had a nice spa treatment. But there's a little one in tow! Has there ever been a Kittiewampus? Not to my recollection! The Calico Jail is located behind Goldie's Place. Sad Eye Joe is pretty sad. What will he look like when mad? 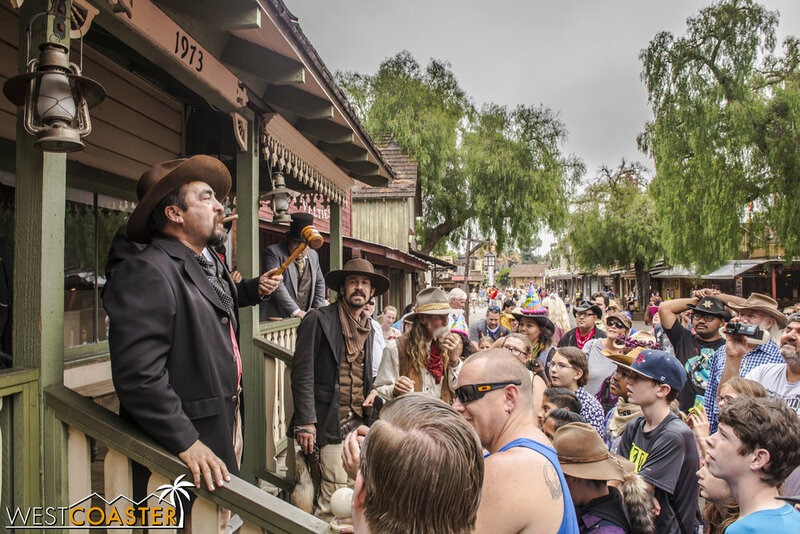 We didn't quite cover some of the entertainment in Ghost Town in our earlier Ghost Town Alive! 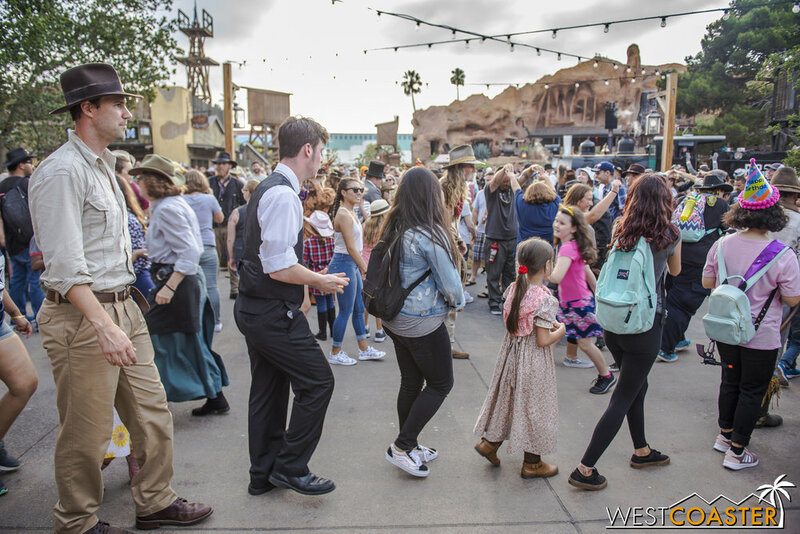 update, so here's a quick look back at some of the show options guests could enjoy in Ghost Town--a couple with some Ghost Town Alive! connections rolled in! 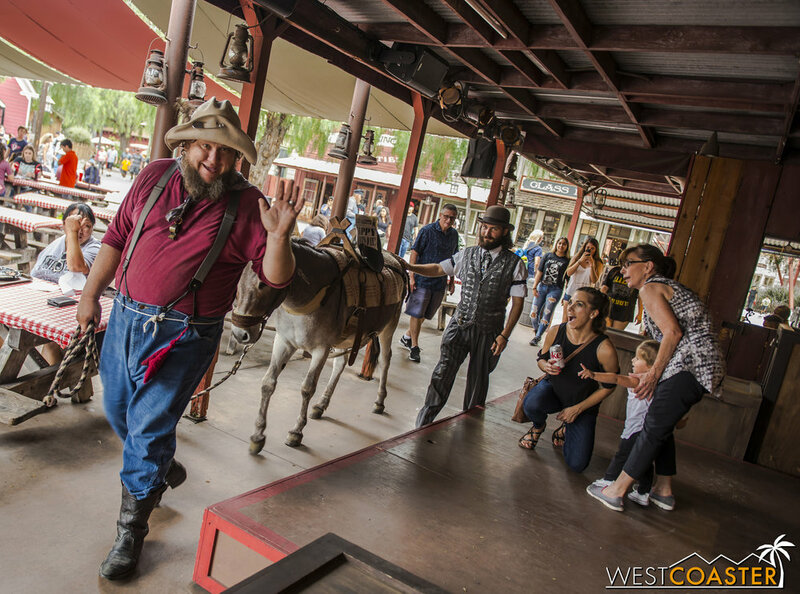 This year's Calico Saloon show once again featured Dakota Dan and Cameo Kate in the lead roles, providing some slapstick humor and witty back and forth banter as Kate passive aggressively hinted at her desire for Dan's hand in marriage. Eventually, she gets it, and everyone celebrates. Dakota Dan and Cameo Kate provide singing entertainment in the Calico Saloon show. Down Main Street and near the Fireman's BBQ Stage by the Fireman's Brigade Barbecue, guests could enjoy some country music with their meals. And sometimes, they're joined by Citizen of Calico, prospector "Cannonball," adding percussion with the spoons. The musicians at the Fireman's BBQ Stage provided some great ambiance to Ghost Town. 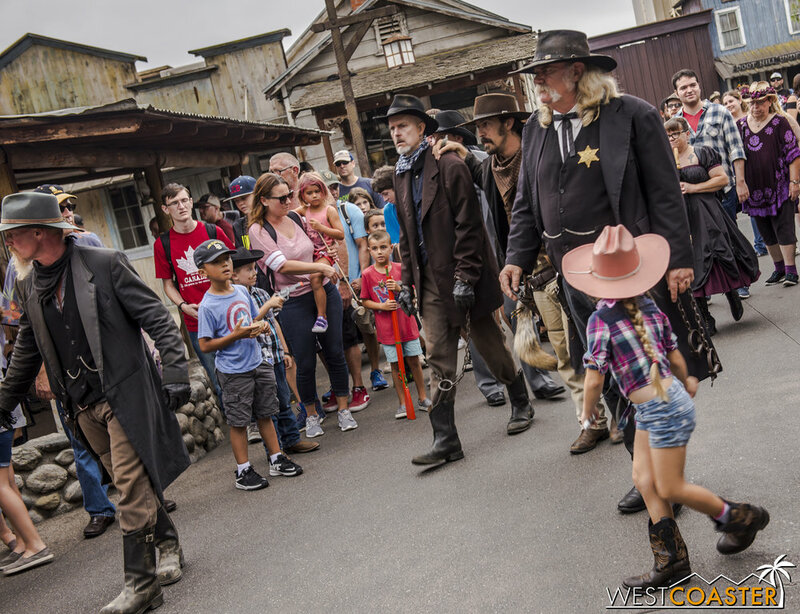 The Wild West Stunt Show at the Wagon Camp incorporated Ghost Town Alive most directly, as several other members of the Mayfield Gang commandeered the show in pursuit of fortune, and the romantic hand of Tabby the Fearless. The action-packed slapstick show featured some fun stunts and gunfights and entertaining recurring gags and seemed to be quite a hit with the audience. 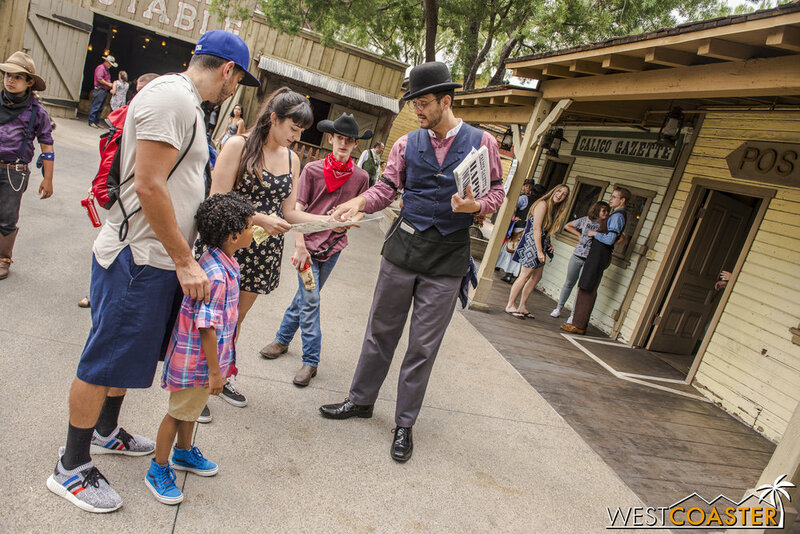 As usual, the Wild West Stunt Show was a fun and exciting summer offering. The 2017 finale of Ghost Town Alive! meant a full cast--doubly full in some cases, as some locations had both the primary and secondary actors present to help ring in the last day of the event. 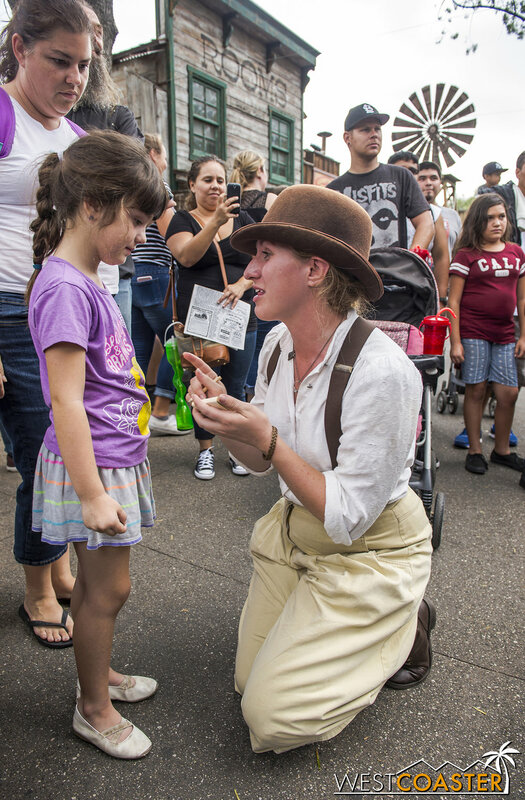 This provided even more chances of guest interaction and a more expansive interactive show. There were several characters I had not seen earlier in the season, either due to chance timing or design, so it was great to see "the whole gang" together on this day. The telegraphist of Calico happens to be in town today. He was not here the last time I visited. Town Clerk, Kenny Storm, enjoys a swig of Mother Murphy's Magical Boysenberry Elixir in a bottle custom made by park guest. Ophelia Finch conceals a secret: she has a deed to the Calico Mine, which means she could potentially be sitting on a mountain of gold! 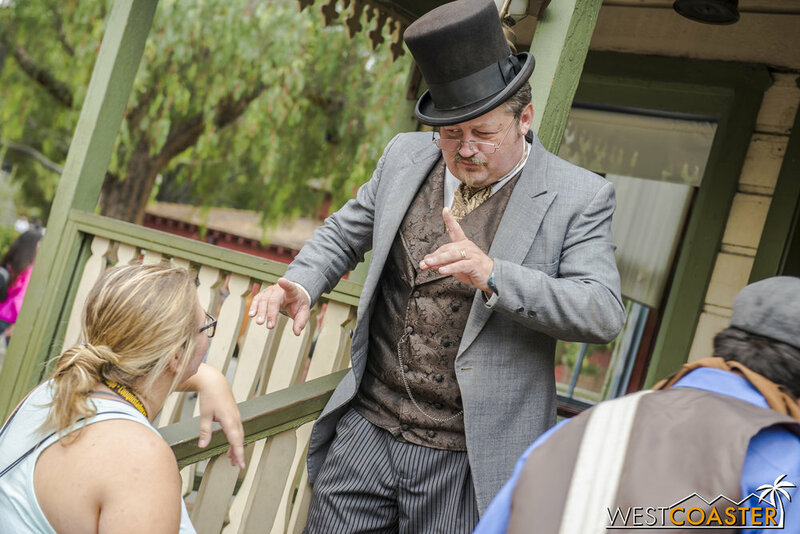 Dr. Dillard Marsh surprises Calico Gazette editor, Bixby Knolls (owner of incredible facial expressions) and his telegraphist with an unexpected appearance. Violet Lee shows off a pretty necklace. Bixby Knolls looks for the direction of the next big news story. Cookie Lemon helps man the window at the Calico Bank. Ike Mayfield shuffles around Calico, avoiding capture. The West sisters, Gertie (left) and Goldie. 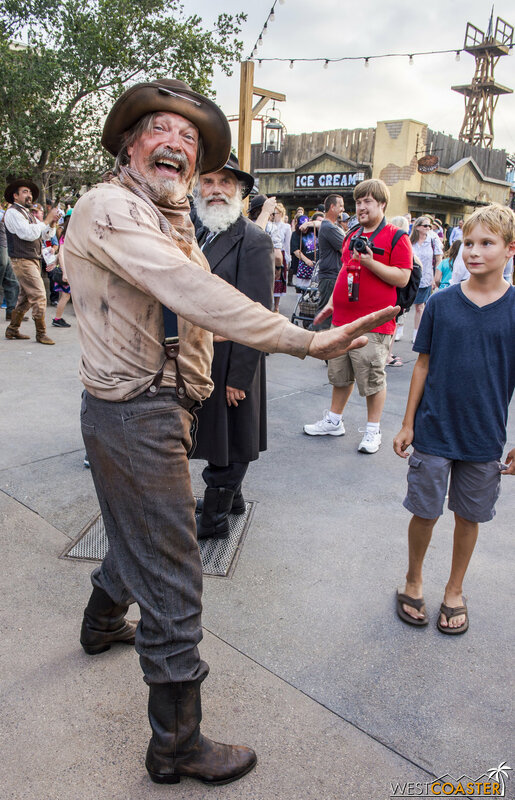 Flint the prospector was getting his gold stolen all day. 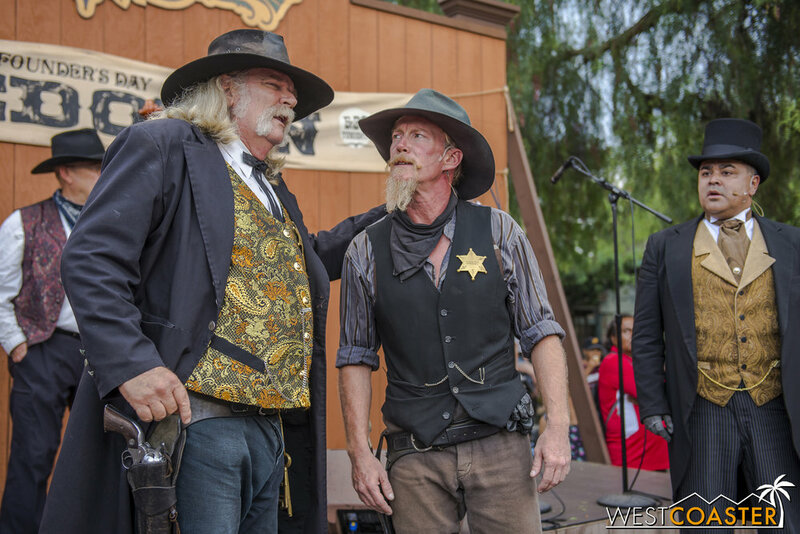 Calico's Judge Roy Bean lays down the law at Town Hall. Looking Glass Thurmond is always trying to get the perfect shot. Calico Bank owner Tate Fortune tips his cap. Schoolteacher Abbie McBride (left) and Miss Sierra pose outside the Calico Schoolhouse. Augustus French (left), the town assayer, stands next to his almost-doppelganger. Deputy Sutton Wynd stands by at the Sheriff's Office while Sheriff Bryce Wheeler is away. Clay Mayfield makes a fine sheriff (spoilers), but more on that later. Of course, few are more beloved and iconic than the regular Calico Sheriff, Bryce Wheeler himself. Of course, as I've written before, the best part of Ghost Town Alive! is the way it really brings the Wild West to life in a cohesive and practically magical way. 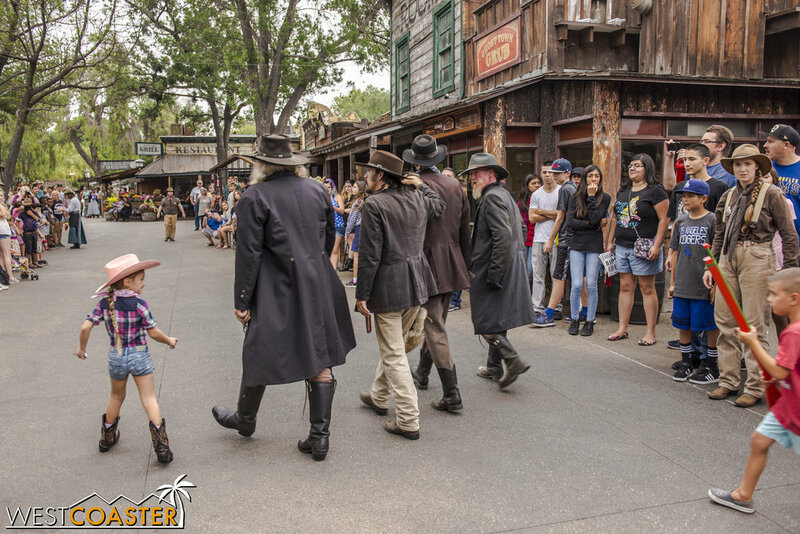 The event has built up quite a following of regular guests who throw themselves into this exciting world of cowboys and bandits. Many come in period-appropriate costumes to immerse themselves into the illusion. 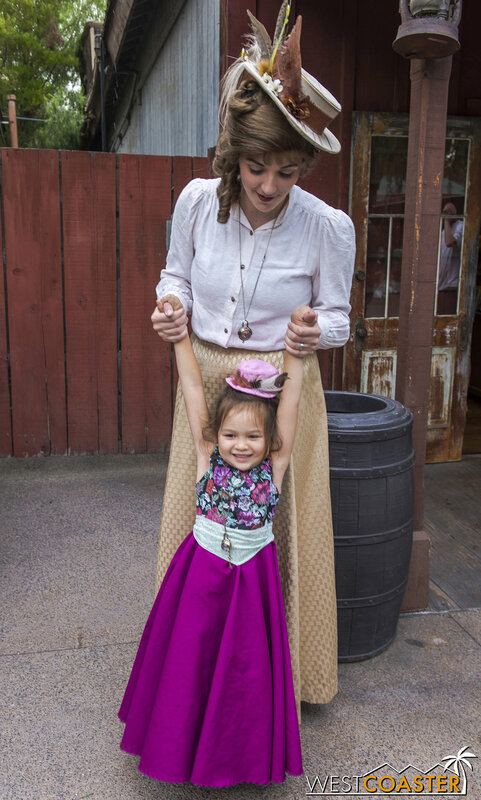 It's like Dapper Day, but with an Old West theme. And fortunately, those guests who do dress up are respectful and do not compete with the actors or try to deceive other guests into thinking they are official actors. But even one-time visitors can be drawn into the story and find themselves performing vital roles to further the narrative along. More than once, I observed a guest coming up to a Citizen of Calico and asking what all the activity was about, only to have the actor explain things in character and promptly and seamlessly rope the guest into participating by delivering a message or package or join them in crafting their own impromptu character of make-believe. It is so easy to fall into the role play. Ghost Town Alive! requires no waiting, no height limit, no limits, really, other than general respect and decent behavior. It's something that anyone can choose to participate in, should he or she desire. And if not, people watching or just moving on is perfectly fine too! The way the actors completely throw themselves into the story and the way guests likewise buy into the plot create a wonderful and memorable collaboration. Loyalties and alliances reveal themselves in fun and entertaining ways, and touching and adorable moments abound between the amazing players and the guests. The improvisational nature of the event provides humor and pleasant surprises. 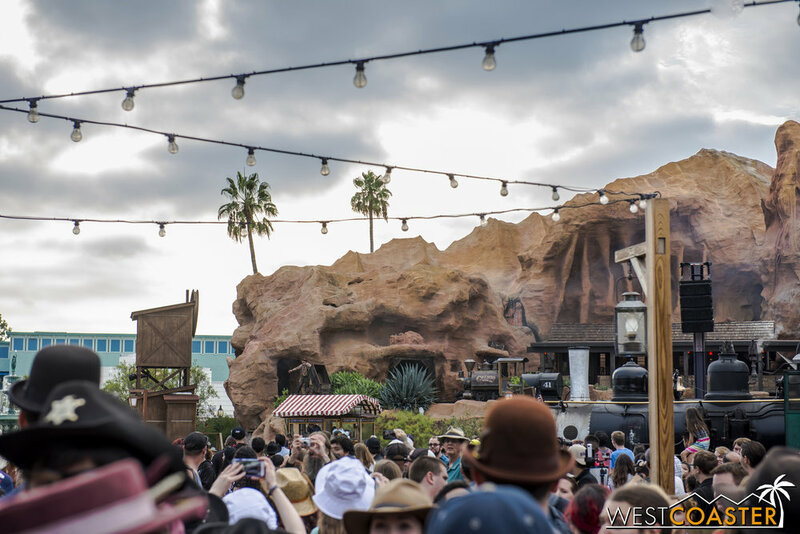 This is the pinnacle of themed entertainment--creating a convincing atmosphere that wholly transports guests to another era, providing an escapist fun that leaves an indelible mark of warm, fuzzy memories. Throughout Ghost Town Alive, I witnessed this over and over again. And it was wonderful to behold every single time. Guests wait to see results of the Calico assayer. In the middle of the day, two guests flat out had a little wedding ceremony, officiated by Mayor Horton Parnell. 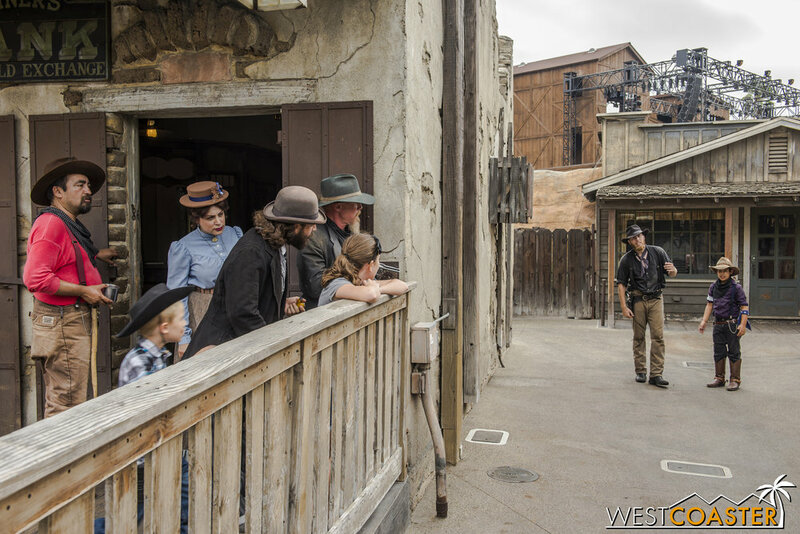 Guests play cards with the Calico sheriff force in Ghost Town. Clay Mayfield has plenty of fans. 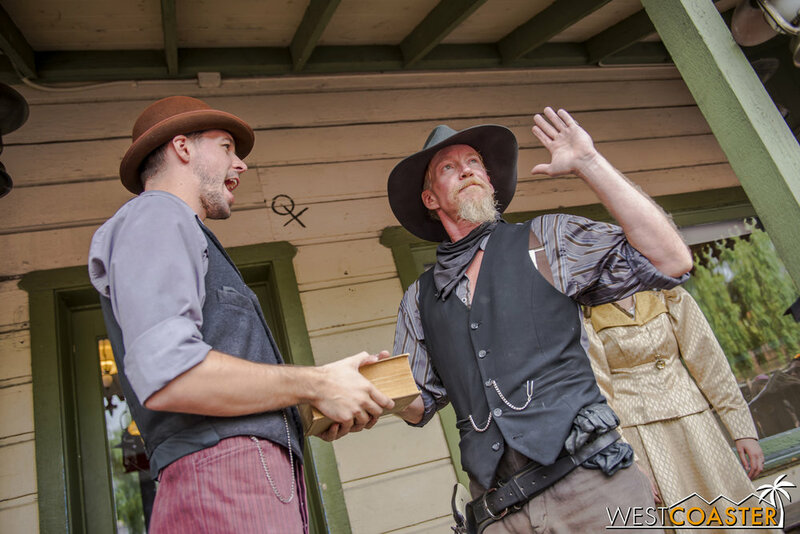 Some guests get VERY involved, such as this case, where a young outlaw holds up Clay Mayfield (who has temporarily aligned himself with the law), allowing Fluke Mayfield to slip by. Bixby Knolls tries to get the latest scoop on the bank robbery. Guests assemble as part of the volunteer Calico Fire Brigade and engage in firefighting practice. 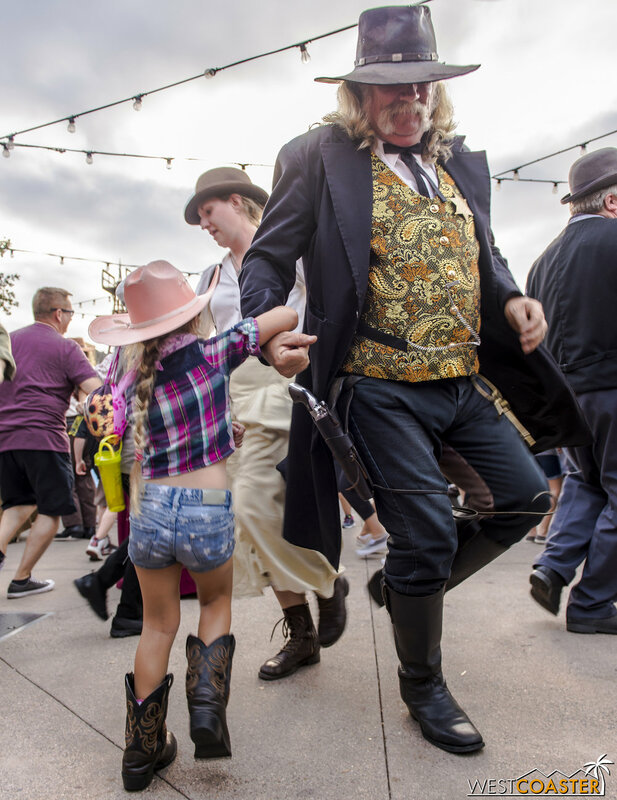 A young guest dances with Sheriff Wheeler at the Calico Founder's Day Hoedown. 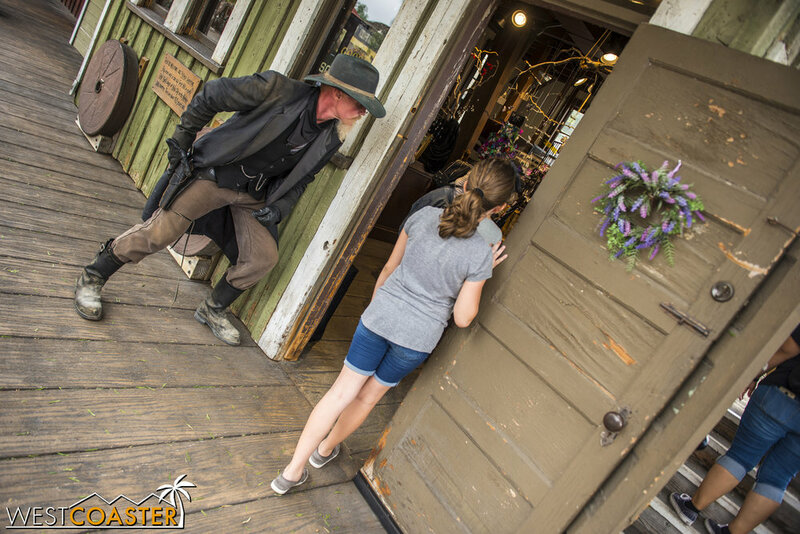 On This Last Day of Ghost Town Alive! 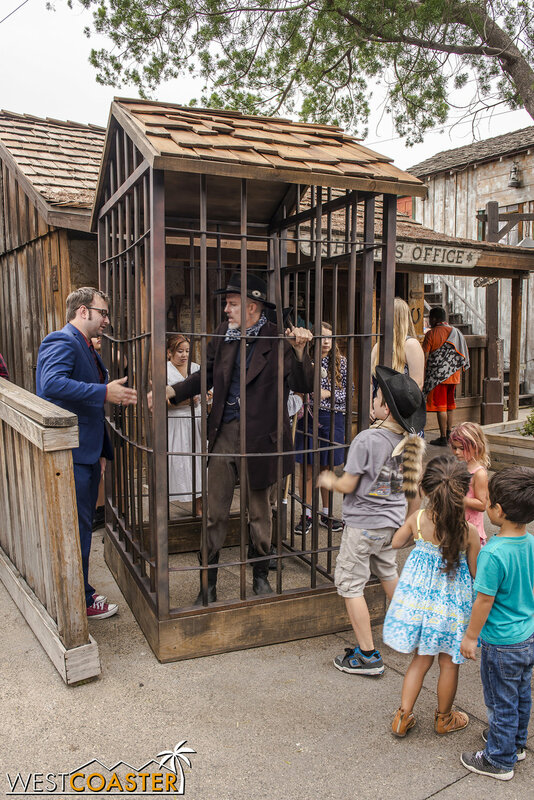 The storyline of this final day of Ghost Town Alive remained relatively the same as it has all year: The Mayfield Gang show up early in the day and are captured and imprisoned. They are put to trial, with their fates decided by the crowd (results vary). At a certain point, the Mayfields are broken loose and later rob the Calico Bank, but only take a slip of paper that turns out to be a legitimate deed proving that Calico is actually owned by the Mayfield Family. At some point, a Mayfield emerges to challenge the Sheriff in the afternoon's election, and he might even win. But ultimately, the conspiracy is revealed, and the bad guys are brought to justice. What was different even from my visit a couple of months ago was the order in which some of these events appeared and the characters playing the principal roles. In our last update, Tiny Mayfield was the mastermind behind plans that betrayed his own family and put him in a position to own the Deed to Calico. This time, however, it was Clay Mayfield pulling the strings, even seeming to reform and join the good guys before eventually revealing his true ulterior motives. 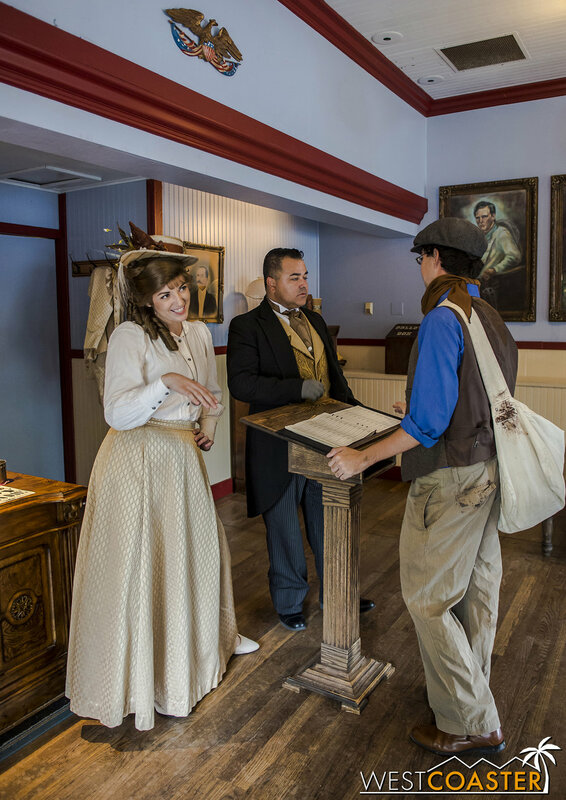 This reflects yet another impressive aspect of Ghost Town Alive!--it's storyline flexibility. The unique and improvisational nature of each day would probably be enough to keep things fresh throughout the summer even with the exact same storyline, but the writers have built in alternates along various sequences and events to provide fresh acts even for the actors themselves, which stimulates additional commitment and joy into the role. By giving the players more options to work with, the Ghost Town Alive! producers create an environment that encourages even more enthusiasm and gives guests different experiences on each visit. That is very cool. The storyline can certainly be a bit intimidating for someone looking to fully follow along, but it's really not that bad. A complete understanding of what has transpired is never required to participate, and the actors do a great job of seamlessly recapping earlier events within their interactions with each other and with guests. 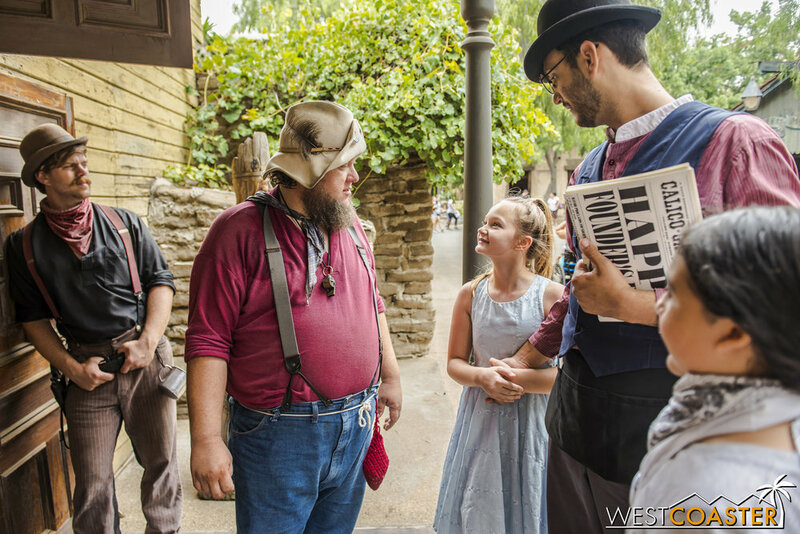 The multitude of moments happening throughout the day does, however, provide a high "replay value," enabling season passholders to return and experience different plot progressions depending on where they decide to go at what time. It is all very impressive! There are main stories and side stories. In this side story, Dr. Dillard Marsh receives a letter that reveals he's actually Clay Mayfield's son! Mayor Parnell looks on in shock. In early afternoon, Ox Mayfield--patriarch of the Mayfield Gang and last year's escape leader--and Pitt Mayfield are put on trial for their crimes. Among Ox's crimes are references to last year's finale: commandeering a train and helping the Mayfield Gang escape. Kid Friday attempts to defend the Mayfields against the accusations. 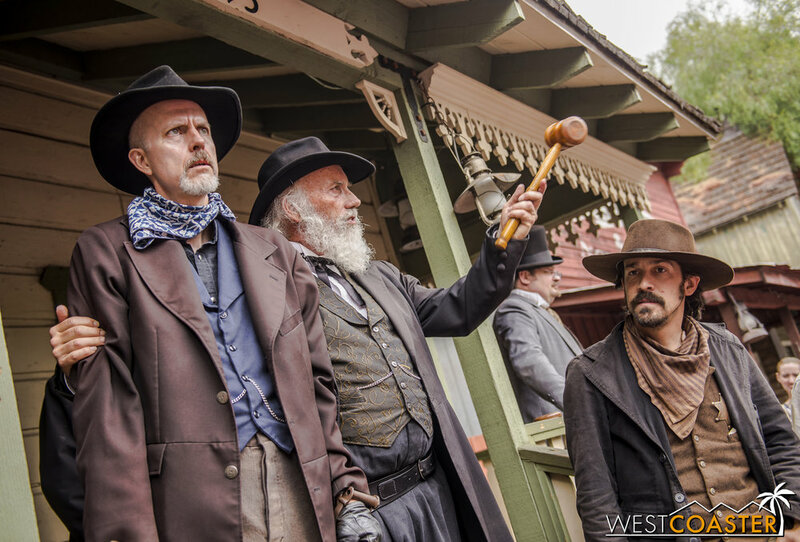 Judge Roy Bean is eager to lock up Ox and calls onto the crowd to judge Mayfield's guilt. Ox hopes for crowd sympathy. The crowd acquits Pitt but convicts Ox! Ox explains that the whole thing was a misunderstanding and also questions why no trial has been brought against Sheriff Wheeler, who he holds responsible for the death of Mudd Mayfield ("may God rest his soul!") during last year's locomotive escape. Judge Bean remands Ox to jail. Ox is escorted to the Sheriff's Office. The other Mayfields cut off the authorities, however, and help Ox escape! Later in the afternoon, they hold up the Calico Bank. Fluke stands guard on the balcony nearby. Ike provides a second lookout. But wait! The Sheriff, upon hearing news of the robbery, has formed a posse to go after the baddies! A gunfight ensues, and the Mayfields scatter, but not before stealing a slip of paper! In an interesting twist, Clay Mayfield, who had been in jail just that morning, has joined the side of the good guys. Exhibiting good behavior and support in chasing down his own family members to bring them to justice, Mayfield seems to have earned the trust of most Citizens of Calico, though not necessarily Judge Bean. Clay drafts a request to his family members urging them to surrender in return for Judge Bean going easier on them in sentencing. The other Mayfields, however, continue evading the law. Like Tiny Mayfield right here. One of the more humorous and possibly unscripted moments of the afternoon involves Ox Mayfield declaring Mayor Horton Parnell not just Mayor of Calico but governor--supported by the votes of a dozen guests in vicinity--followed by an attempt to have Parnell pardon him. Judge Bean arrives just in time to put a stop to that, however. Clay Mayfield interviews Tate Bonnet, who was locked in the bank vault while the Mayfields were robbing the bank. 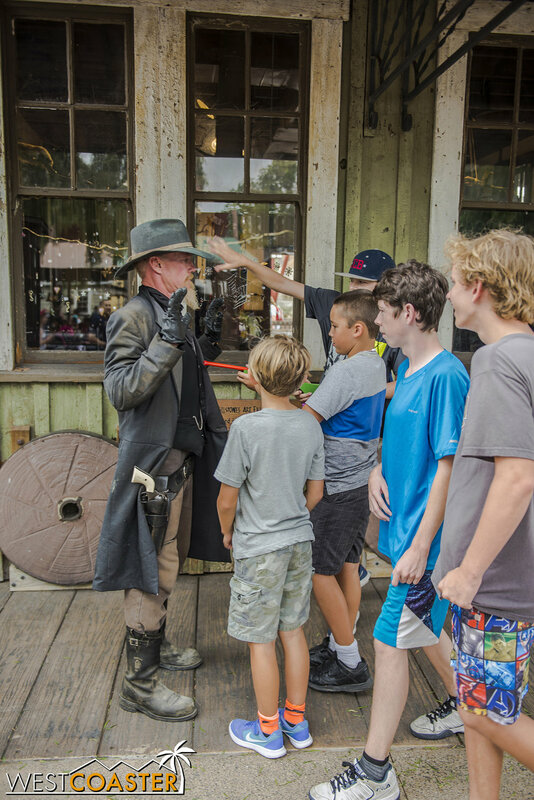 Word arrives that the Mayfields have been spotted holed up a the Calico Saloon, so Sherrif Wheeler and his deputies deputize volunteer guests to help them capture the bandits. Despite being surrounded, Ox Mayfield is defiant against Wheeler. After a brief shootout, however, Ox is captured, trapped by his own son, no less! Ox is brought to Town Hall to stand trial yet again. He is accused of stealing from the Calico Bank, but he promptly proclaims that the paper the Mayfields "stole" was actually the deed to the city that rightfully belongs to them. Sound familiar? The same happened last year. Only this time, the deed is actually legitimate! The Mayfields have a right to the deed, but because Ox and Tiny and Ike and Fluke and Scruff have all been captured and convicted of other crimes, the deed goes to the next free Mayfield in line--who is Clay! The rest get thrown back in jail. Ox wants nothing to do with this and attempts to find a roomier space up higher, in a "less crowded" part of the jail cell. Ike is none too happy about the situation. Ox is definitely not happy either. Tiny Mayfield strikes a pitiful sight, as he can't survive in these conditions. He tries to make a break out of the bars (possibly prompted to do so by yours truly). 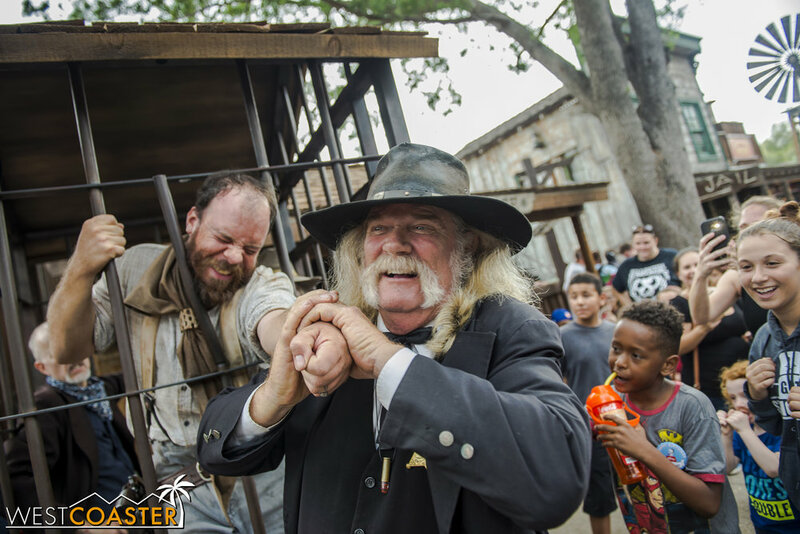 Sheriff Wheeler decides to "help him out" by pulling him through, causing severe discomfort. That's the Sheriff's way of having fun at Tiny's expense. Prisoners rights weren't a thing back in the 1800s! In a surprise twist, Clay Mayfield announces his intention to run against Sheriff Wheeler in the election later in the day. He owns the deed to Calico, and based on his experience and education on the job, he feels qualified to be the new and better sheriff. Bryce Wheeler is none too pleased or impressed by that. At 3:20, the election for Calico Sheriff opens, and there is a huge turnout! 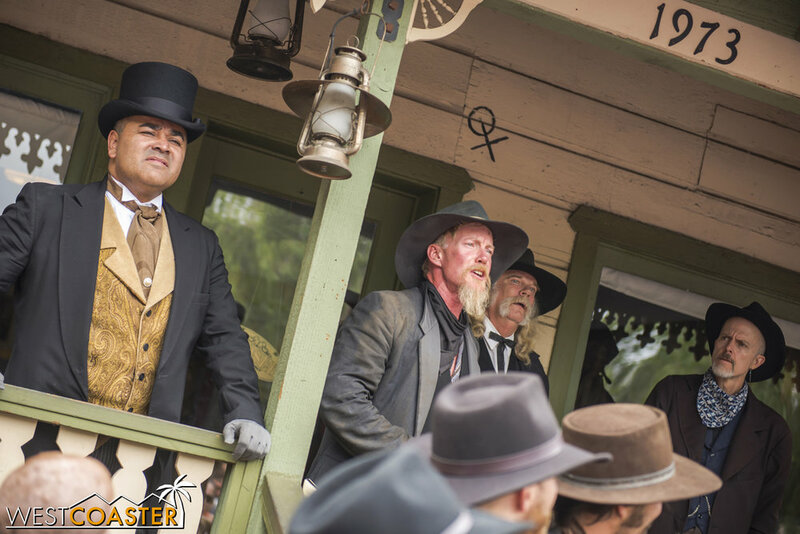 Kenny Storm and Judge Roy Bean look on to make sure voting is being conducted fairly. Then comes time to announce the results. The Mayor's wife, Pearl Parnell, chairwoman of the Calico Fair Election Committee, gives an introduction. Kenny Storm prepares to give the results. As usual: "LADIES AND GENTLEMEN..."
"ARE YOU READY FOR A READING????" Bean: "Just read the results." In a monumental upset, Clay Mayfield wins the election! Kenny Storm swears Clay in. The election is legitimate, and the results counted accurately. Guests actually affect the direction of the story here. Clay endures Kenny Storm's verbal blasts as he is sworn in. Clay returns to the Sheriff's Office, warning nearby people to cover their ears. Clay pardons his fellow Mayfield Gang and family members, revealing his true loyalties. It was just a plot all along! Father and son embrace after the success of the Mayfield scheme. Now they're free, AND they own the town of Calico! Everything culminated in Calico Park with the 5:30 Founder's Day Hoedown. 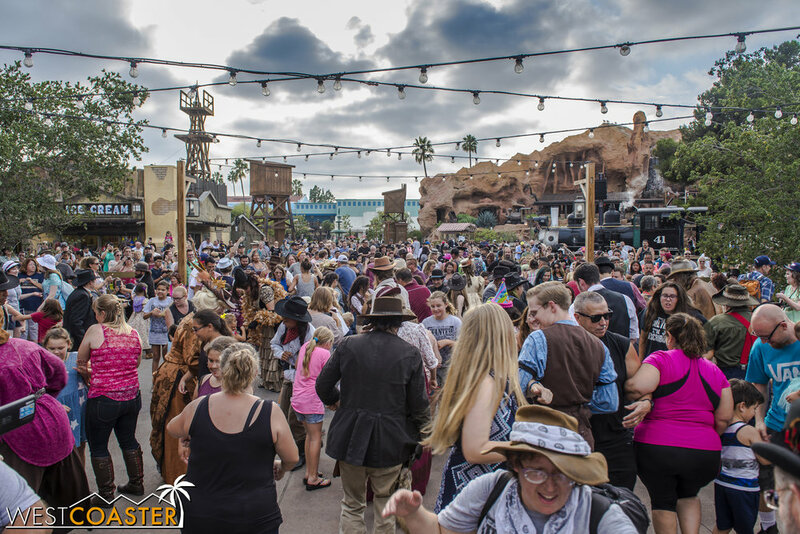 Once again, Scruff Mayfield called out all the dances, and even the "bad guys" behaved civilly, interacting with guests and generally enjoying the day. Normally, the Hoedown climaxed with the revelation of the Mayfield's conspiracy from The Raven, a mysterious character who had been sending messages to various Citizens throughout the day revealing certain secrets. On this day, however, Citizens had been receiving messages from a certain "Ol' Peg Leg," a mysterious prospector (and father of Ophelia Finch) who had long been thought dead (that sounds familiar; didn't they say the same about Ox Mayfield last year?). Gold had also been popping up everywhere, practically sifting out of the ground. But it was Peg Leg's clues that lead Sheriff Wheeler to the truth, outing Clay Mayfield's scheme to frame his family members and get the deed to Calico himself (at least he pardoned them afterward!). Although the Mayfield conspiracy was solved, one item remained open. Throughout the day, buoyed by reports that her father had been leaving messages around Calico, Ophelia Finch had been searching for her dad, hopeful that he was alive after all. And as the Calico Citizens began to wrap up the Founders Day festivities, Ophelia crept onto the stage to make one last effort to locate her pa. It all seemed for naught, however, until an explosion over at the Calico Mine rocked the air, and a dusty, soot-covered figure emerged from an old mining hole. It was Peg Leg! And he had found gold beyond comprehension! Turns out Calico was sitting on top of the mother lode, and everyone was now rich! Ophelia wanders onto the stage. Asked what she's doing, she replies that she was really hoping that rumors of her father being alive were true. Suddenly, explosions fire off at the Calico Mine. A sooty figure appears, announcing that he's struck it rich. It's Ol' Peg Leg, and he IS alive! 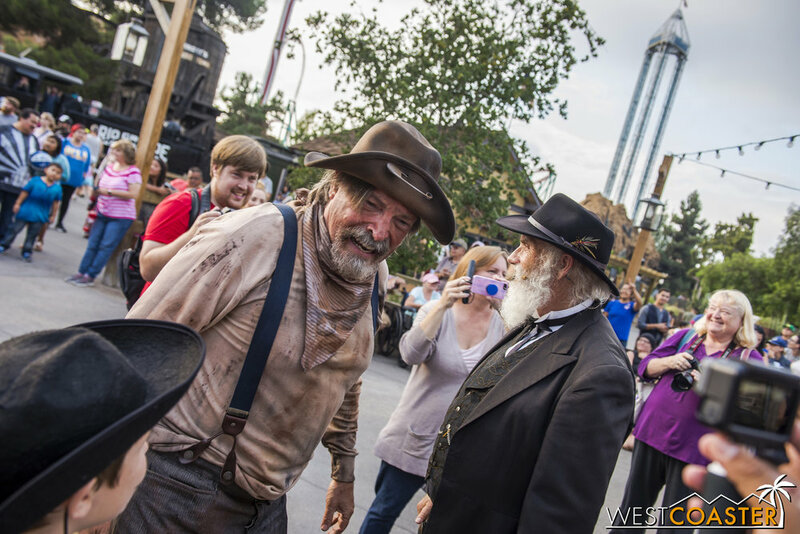 The crazy old prospector is happy to purchase the deed to Calico, which has been stripped from Clay Mayfield. Father and daughter are reunited, as a new edition of the Calico Gazette proclaims the amazing news. 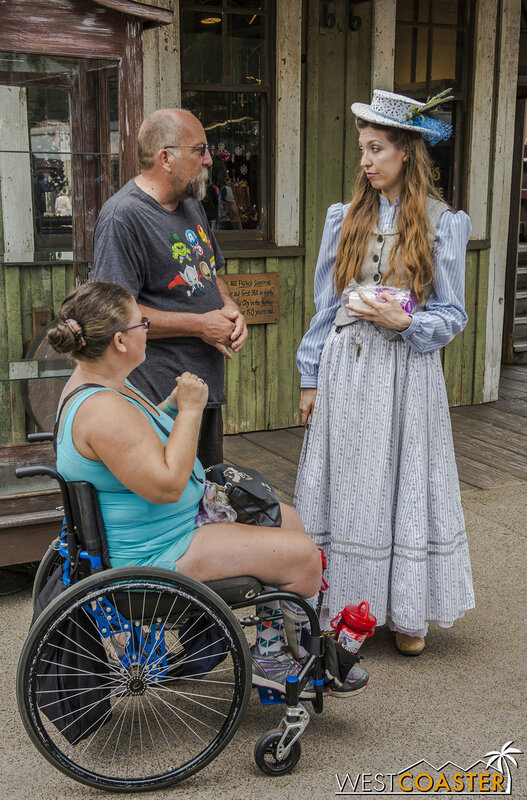 Peg Leg poses for photos with guests. 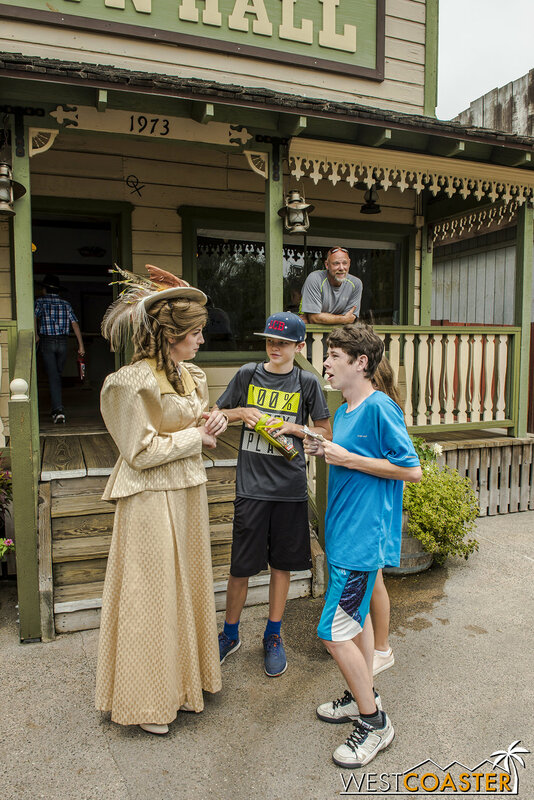 With Calico now under newfound riches, the Founder's Day Hoedown closed with a flourish--everyone eager to get a piece of the golden fortunes now known to be lying under the town. Once the Hoedown formally ended, the Citizens of Calico spent extra time taking pictures with fans both newly-made and regularly-attending. It was an emotional moment as this second chapter of Ghost Town Alive came to an end, bittersweet for many people, but touching all the same. The Mayfield Gang (including newly discovered member Dillard Marsh) pose for a group photo with guests. Dr. Linville Carter poses with Miss. Sierra. Pearl and Horton Parnell pose with the latest copy of the Calico Gazette. What a pleasantly surprising way to close out this Founder's Day! At the end of the day, all of the Ghost Town Alive actors gather for a massive group photo. Last year's gun blazing finale clearly signaled that Ghost Town Alive! would return this year to piece together the cliffhanger. This year's ending wasn't necessarily a proper cliffhanger, since striking gold could be seen as a happy ending. But given how successful and popular Ghost Town Alive! has been, I would be greatly surprised if it did not return next year. 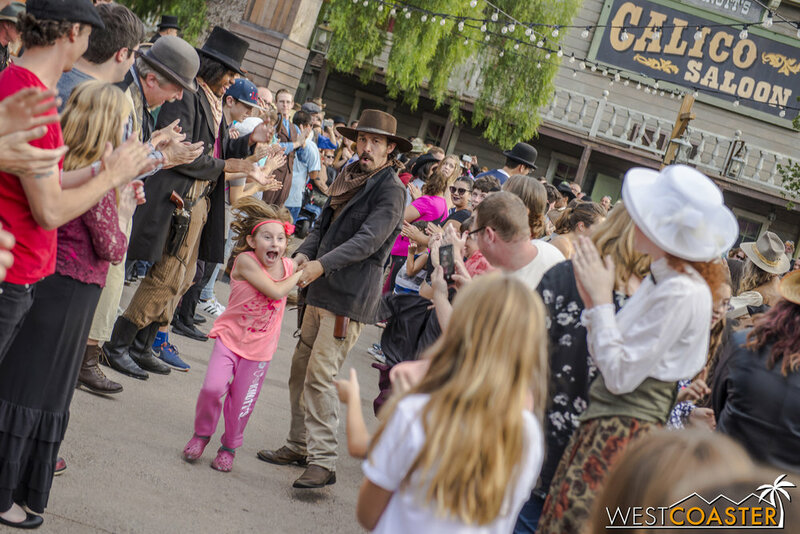 As I mentioned at the close of last year's inaugural edition, Ghost Town Alive has provided that wondrous refuge from the real world where both actors and guests can become lost in an entrancing story and embrace the exciting happenings of make-believe. Whether it's children forging memories that will last a lifetime or adults reliving the role plays of childhood, the conditions for happy and positive memories are very finely laid down by everyone involved in producing the event. This means the actors, wardrobe people, and makeup artists all the way to the technicians, supervisors, and performers who bring this interactive play to real, three dimensional life. If I keep on sounding like a broken record, it's because I cannot say enough good things about Ghost Town Alive! 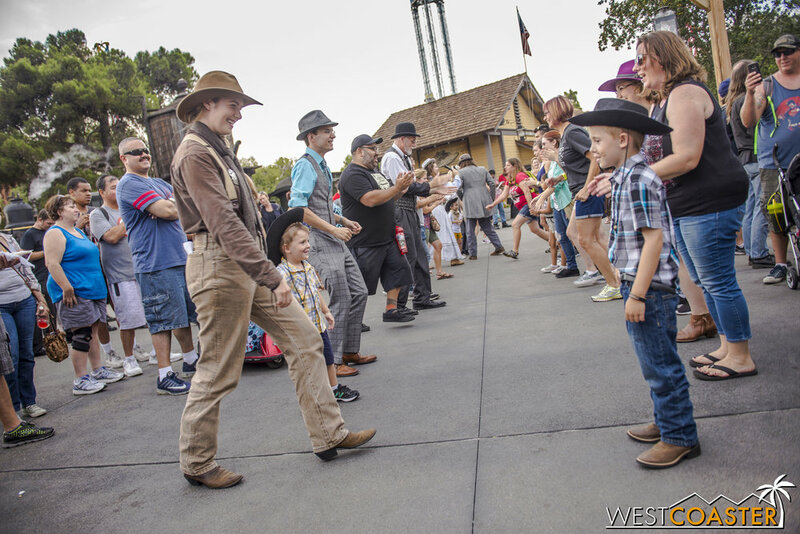 It is nostalgia and innocence and fun and excitement and adventure and improv all rolled into one, within a setting that only Knott's Berry Farm can provide, referencing old traditions and creating new ones. Ghost Town Alive! rocks, and it's firmly entrenched itself as a seasonal staple. 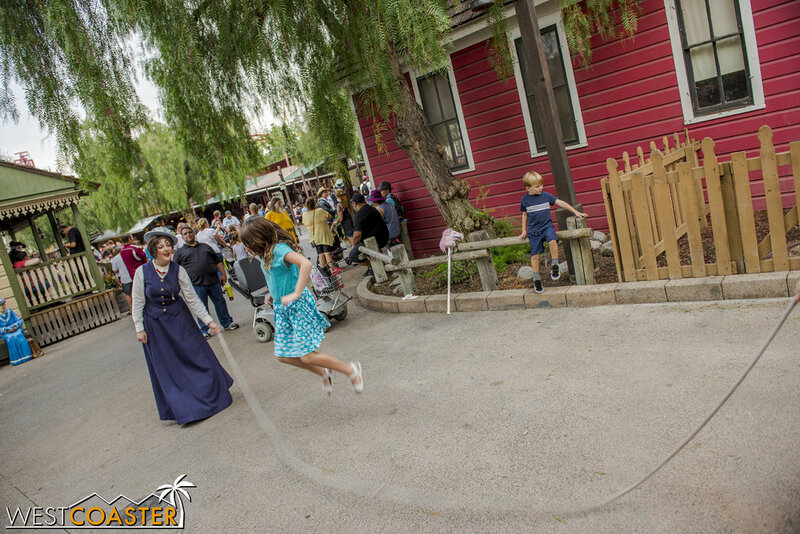 Knott's advertises it as much, serving as the summer event before autumn brings Knott's Scary Farm (and winter carries Knott's Merry Farm, and spring ushers in the Boysenberry Festival). I certainly hope it returns next year, and I expect it to. It's too good not to. 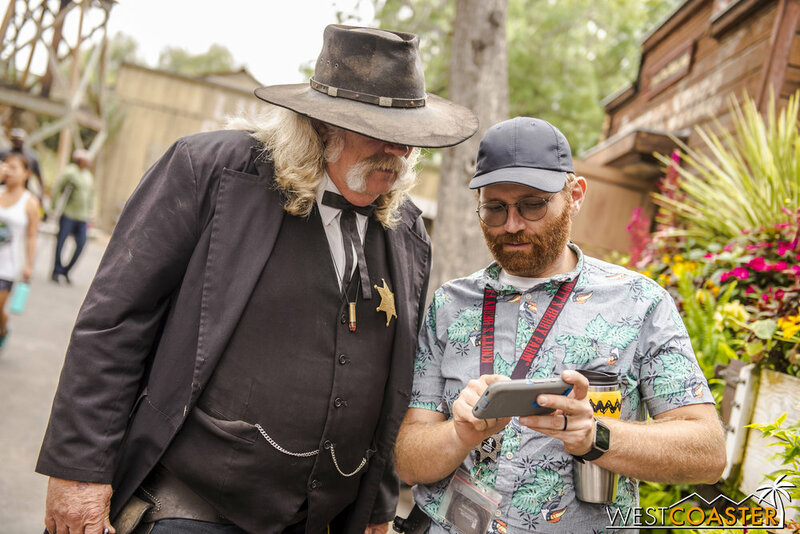 Knott's Vice President of Entertainment, Ken Parks, and everyone involved with Ghost Town Alive! have certainly struck gold with this amazing event. Thank you to everyone, and looking forward to what next year brings!